Hi Brandi, I would love to give my doggie a little Irish lilt. Tell me what I need to do to get the picture to you. It is the one I am using on my avatar. Thanks Camilla. You dog is very cute, but very small in that avatar picture! I resized him/her a bit but I can't enlarge it much or it gets distorted. If you have a picture of your dog that is a little bigger, I can work on an Easter theme for you. If you do, just post it in this thread for me. Hope you like one of these enough to enjoy tomorrow for St. Patrick's Day! I have made several Easter avatars for you! I will post all of the Easter avatars starting tomorrow night, so they are ready right after St. Patrick's Day! I will be posting all the Easter avatars I have made tomorrow night, March 17. So anyone who wishes to get out of their St. Patrick's Day attire can go straight into brand new Easter clothes if you like! Hi Brandi. I am so new that I stuck on a little green hat by myself, but that for me was very advanced. Actually, my first time. Your dressed-up avataras are so wonderful that I would appreciate some Easter appropriate accessories for my nearsighted chihuahua. I have a larger one without the hat if that would be better. Again, I am new. I do not know what I am doing or how to go about it. Just let me know when I am "out of line" please. Today is a very busy day for me, but I'll be happy to decorate your avatar for Easter. I will be posting about 40 people's Easter avatars here tonight that i have been working on the past few months. I'll post yours here when I have completed it, so be sure to be checking for it. Thanks Brandi, There is no rush for this, so anytime will be fine. Top of the day to you, Brandi. I haven't been posting much lately, so didn't even think about getting my avi up-to-date. Now that it's spring, could I get some pretty flowers, butterflies, or the sorts? I suppose that an Easter hat would probably be way too much for that lettuce head of mine. Golden Oldie: I have missed your posts, and am glad to see you are still around, lady! 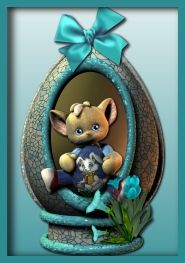 I have already made the Easter avatars and will be posting them tonight! Check back later tonight or tomorrow to see what I picked out for you! Thanks Brandi can't wait to see the Easter outfits. Could I maybe get help with an Easter avi? I'll go searching for a graphic this afternoon for a starting point. Just post the avi you want me to use and any special requests here when you have them. You got something for me Brandi? Hello sweet Brandi, I feel like a kid again, waiting for the Easter Bunny. I will be kind of sad to see Casper out of his lil green outfit but can't wait to see what tonight will bring. I just want you to know how happy your hard work makes me. You are very talented and very kind to share your talents with so many monkeys. I removed your tiara and exchanged it for an Easter bonnet, gave you a brand new dress, and refreshed your lipstick from marymary's original lipstick! I went shopping for your bonnet, and chose one of the most expensive ones I could find. Only the best for the high-maintenance monkey! I remember you asking me to make you blink some time ago; I think it was around Christmas time. So I thought you might be ready to get your blink back, too. In case you do, I added one with you blinking. AND I added eyelashes!!! First time for me adding eyelashes to an avatar. LOL Look how you bat those eyelashes now! The second one, I exchanged your diamond drop earrings for tasteful pearls for Easter, and changed the color scheme. The third one is more for fun with a crazy bonnet, eggs and flowers and all. Ears custom-made for an Easter dog! Made these back when you were using the other avatar. If you want any revisions on the avatar you are currently using, let me know. I decorated the one you are using to be able to use everyday or for Easter! I put your regal self out in the middle of a flower field for Easter! Just have to tell you that I created the perfect 4th of July avatar for tinkerbell! (Just started working on a few 4th of July avatars, and I am really happy how tinkerbell came out!) And I'd like to thank you for coming by here almost every day to check on me! That is so nice of you. I spend a lot of time working on avatars here, and it can get kind of lonely at times. So, thanks again, Trimm! You are da best! numbersgirl: Must be hard to concentrate on numbers out in this beautiful field, eh? When I found out I did not have to keep you in the frame, I put Zoe in the dog house! ...and if you like her in the dog house, here is one to use for everyday wear!